This week’s Project Pastry Queen was this delicious butternut squash soup. It’s thick and creamy with the perfect amount of spice. I tend to stay away from many soups because they contain so much cream. This one did too but it’s optional. I went without the heavy cream but did add the sour cream. Next time, instead of spending so much time peeling and cutting the squash, I’ll roast it like Sarah from 20 Something Cupcakes. This soup is definitely better warmed up the next day after all of the flavors and spices have time to blend. Add the onion and carrot. Saute over medium heat for about 3 min or until onions begin to soften. Add the squash, potato, ginger, cinnamon, curry powder, and salt. Saute for 2 min. Add the stock, milk, cream, honey, and paprika. Bring soup to a boil. Cover and simmer on low for about 45 minutes or until vegetables are soft. In batches, puree the soup in a blender until smooth. Add pepper to taste. 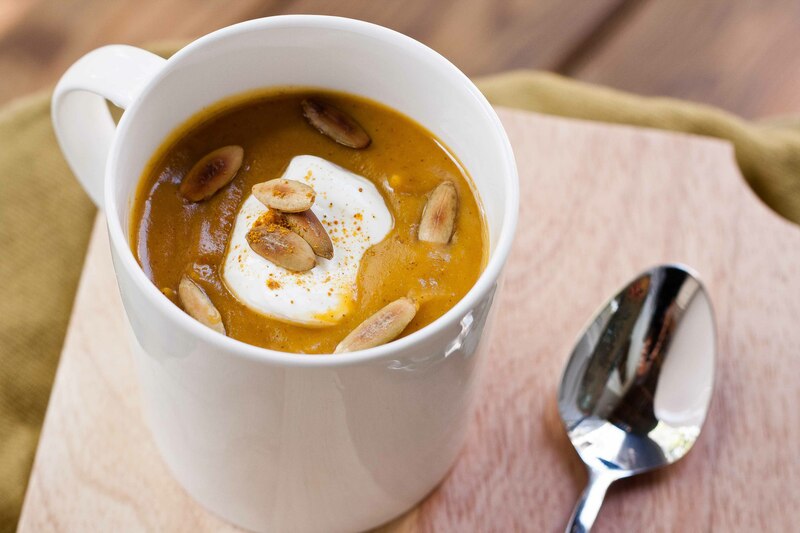 Serve with a spoonful of sour cream and sprinkle pumpkin seeds. A little more Mexican for you! Andy and I have a new favorite roadside stand. They have a large variety of fruits and vegetables. The owner showed us what had been picked that morning so we’d have the freshest vegetables and she even showed us the fields with what they were going to have ready to harvest in the fall. We’ll definitely be visiting them again. We ended up buying some late summer sweet corn before it’s gone until next year. I’ve had my fill of corn on the cob this summer but I wanted something that was going to showcase the corn. After an amazing bowl of corn chowder I had at a restaurant in Seattle, I had to make my own. This recipe has been family-in-law and even 20 month old approved! It was a hit at a family birthday gathering the other day. 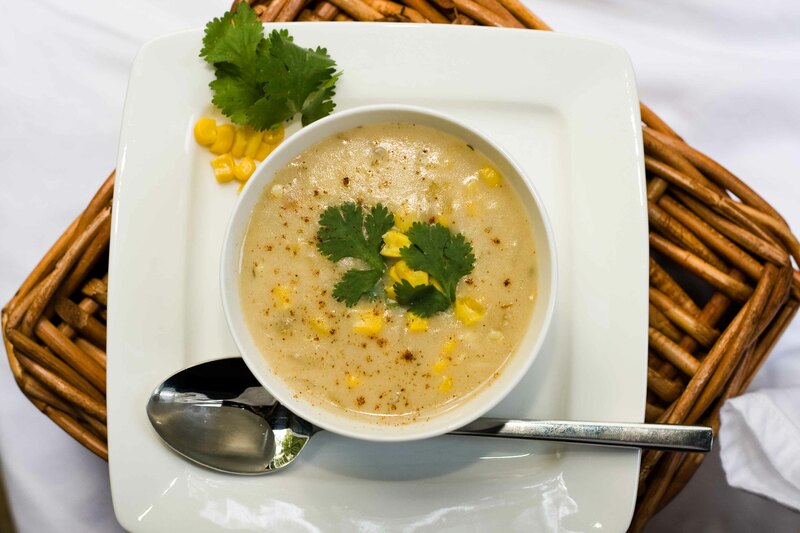 While corn is roasting, start making the soup. Heat the butter and 1 T olive oil in a soup pot over medium heat. Add the onion, garlic, salt, chili powder, cumin, and thyme and cook until onions are translucent. Stir flour into vegetables until fully combined. Pour in the chicken stock and bring to a boil. Add the cream and potatoes. Bring to a boil for about 7 minutes, gently stirring. Stir in corn, green chilies and chicken (optional). Season to taste with salt and pepper. Simmer for 10 min. Garnish soup with chopped cilantro. This chowder isn’t spicy and could definitely be kicked up depending on who’s eating it. I would try garnishing the chowder with jalapeños and/or increasing the chili powder.